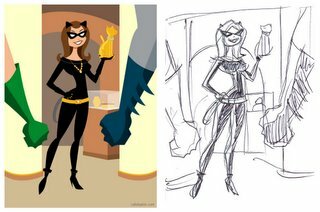 cal slayton | illustrator | graphic designer | comic book artist | dallas | dfw: Catwoman - Julie Newmar Style! I realized that after doing a lot of these Illustrator pieces that I really haven't done any comic book characters in a while. So I decided to do one and, after a bit of consideration, I thought I'd do Catwoman. I originally sketched Catwoman in her current costume jumping from one rooftop to another. But I started thinking about how much I dug Julie Newmar in the old 60's Batman series. So, I went retro (like I'm prone to do) and did the piece above. I even snuck Batman and Robin into the picture. I hope you dig it! Hot Damn!! 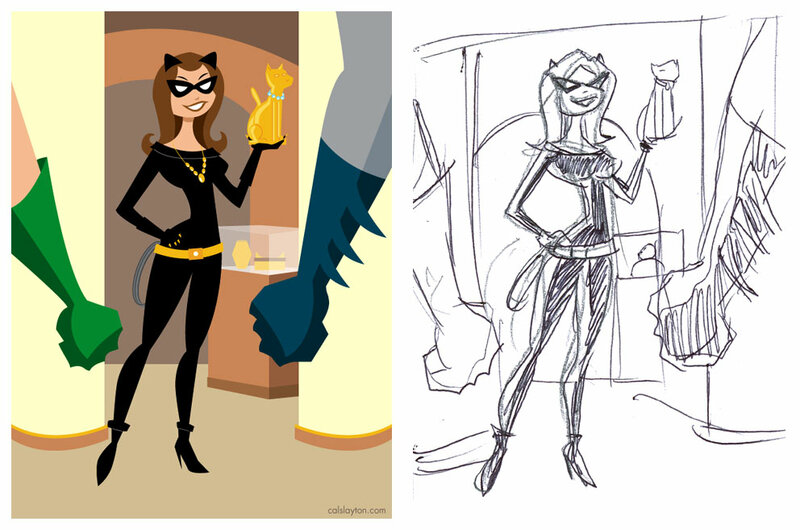 Very Cool Stuff...do plan to use this for the DW Catwoman draw-off? Damn, you're good! I've got to get on this "Illustrator" schtick. Oh, I checked out your studio pictures. The Executioner and Darwyne Cooke?! That's awesome. and it looks like your skill is growing in leaps and bounds. spacelord - It's rare when someone mentions the Executioner to me. That's awesome! james - I appreciate it! It's too bad Gold Eagle cut back on their books. I haven't read an Executioner since about #40, but my absolute favorite title was the S.O.B.s. That series rocked. Oh, and keep up the dynamite work. Very cool, you really captured a lot of Batman in his one drawing.